In its advertising push for HomePod, Apple has touted its smart speaker as capable of delivering consistent sound to listeners positioned anywhere in a given room. New testing backs up those claims, and offers insight into how the company accomplished such a feat. As part of an ongoing HomePod evaluation, Fast Company partnered with professional acoustic analysis hardware and software maker NTi Audio to measure the speaker's performance in reporter Mark Sullivan's living room. Setting up HomePod on a table near a wall, a specialized microphone was used to capture white noise test sound from four different locations. Results were compared to generate a sound profile for the speaker, which displayed an average variance of 0.95 decibels across all audible frequency bands. As NTi notes, humans are typically unable to detect changes below a decibel, meaning this particular test backs up Apple's claims that HomePod will deliver consistent sound to listeners positioned just about anywhere in a room. "The developers have done an excellent job of having the HomePod adjust to the room; (it has) Impressive consistency in overall level and frequency response," said Brian MacMillan, associate general manager at NTi. "The HomePod automates spatial compensation that previously required a real audiophile's expertise, tools and time." To achieve such consistency, HomePod employs an array of six exterior microphones and a digital signal processor to analyze its surrounding environment. 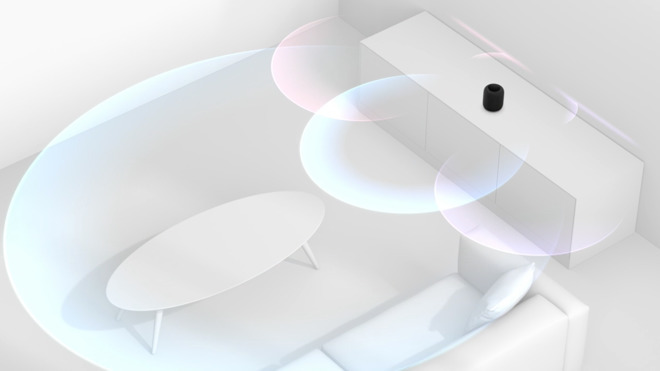 Another microphone located inside HomePod's chassis detects nearby objects like walls and other large obstacles that might interfere with generated sound waves. An onboard A8 chip applies collected microphone data to advanced algorithms to dynamically modify sound output from each of the speaker's seven tweeters and its single woofer. These adjustments are made when HomePod is set up, moved and during music playback. The result is highly consistent, adaptive and immersive audio. Most importantly, the entire process is performed in the background without manual intervention from the user. The Fast Company analysis validates AppleInsider's report detailing the inner workings of HomePod's audio magic and follows a similar evaluation that found Apple's speaker provides a nearly flat representation of sound, a metric often used to quantify audio quality.